Price: £1.50 (incl VAT) Sorry, this item is currently unavailable. Click here to receive notification when this product comes back into stock. 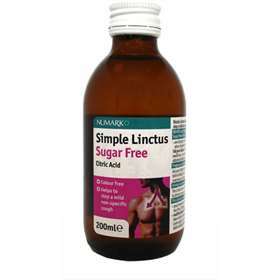 A Numark colourless sugar free simple linctus for adults to help stop a mild non-specific cough. Numark sugar free simple linctus acts as a demulcent, coating the throat helping to calm a Sore throat and reduces the urge to cough. For the relief of a dry cough. 1 x 5ml spoonful to be taken 3-4 times daily. you are allergic to Citric Acid or any of the other ingredients listed in this medicine. Tell your doctor if you are taking other medicines. If you take more simple linctus than you should over a long period of time it may cause erosion of the teeth or local irritation. Ask your doctor or pharmacist for advice before taking the linctus during pregnancy or if you are breast-feeding. Citric Acid Monohydrate 125mg/5ml,Glycerol (E422), SodiumCarboxymethylcellulose, Sodium Benzoate (E211), Saccharin Sodium (E954), Maltitol Liquid, (E965), Ethanol, Star Anise Oil, Purified Water. As with all medicines keep out of the sight and reach of children. Product code: 1061233 Price: £1.50 (incl VAT) Sorry, this item is currently unavailable. Click here to receive notification when this product comes back into stock.